You'll discover tucked-away gems like European Solidarity Centre and Sopot Pier. Change things up with these side-trips from Gdansk: Malbork Castle Museum (in Malbork), St. Nicholas Cathedral (Katedra Sw. Mikolaja) (in Elblag) and Jurata Beach (in Jurata). And it doesn't end there: don't miss a visit to Dluga Street (ul. Dluga), visit a coastal fixture at Rozewie Lighthouse, take a stroll through Old Town, and get great views at Observation tower in Wdzydze Kiszewskie. For other places to visit, more things to do, traveler tips, and tourist information, you can read our Gdansk road trip planning site . Melbourne, Australia to Gdansk is an approximately 27-hour flight. You can also do a combination of flight and train; or do a combination of flight, bus, and train. The time zone changes from Australian Eastern Standard Time (Victoria) (AEST) to Central European Time (CET), which is usually a -9 hour difference. Prepare for much colder weather when traveling from Melbourne in December: high temperatures in Gdansk hover around 3°C and lows are around -1°C. Finish your sightseeing early on the 22nd (Sat) to allow enough time to travel to Krakow. You'll discover tucked-away gems like Cloth Hall (Sukiennice) and Lost Souls Alley. There's lots more to do: examine the collection at Cracow Historical Museum - Old Market Underground, contemplate in the serene atmosphere at St. Mary's Basilica, appreciate the extensive heritage of Planty Park, and make a trip to Mogila Abbey. To see traveler tips, reviews, ratings, and other tourist information, refer to the Krakow visit planner. Traveling by flight from Gdansk to Krakow takes 4 hours. Alternatively, you can take a train; or drive. In December, daily temperatures in Krakow can reach 5°C, while at night they dip to -2°C. Finish up your sightseeing early on the 25th (Tue) so you can travel to Lausanne. Explore hidden gems such as Chateau de Chillon and Olympic Museum Lausanne (Musee Olympique). 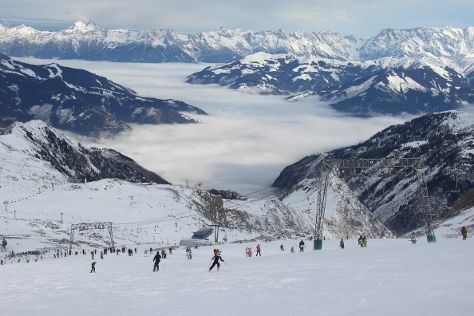 Get out of town with these interesting Lausanne side-trips: Mont-Fort (in Verbier), The Mont-Fort (in Nendaz) and Castle of Gruyeres (in Gruyeres). Spend the 28th (Fri) exploring nature at Lavaux Vineyard Terraces. Next up on the itinerary: contemplate in the serene atmosphere at Cathedrale de Lausanne, pause for some serene contemplation at Eglise Notre Dame, make a trip to Sauvabelin Tower, and tee off at Franck Ollivier Golf Pro. To see photos, other places to visit, and more tourist information, go to the Lausanne trip planner . Do a combination of flight and train from Krakow to Lausanne in 6 hours. Alternatively, you can do a combination of flight, bus, and train; or drive. Finish up your sightseeing early on the 29th (Sat) so you can catch the train to Zermatt. You'll explore the less-touristy side of things at The Matterhorn and Photopoint Kirchbrucke bridge. Next up on the itinerary: hit the slopes at Matterhorn Ski Paradise, have fun at Clay Shoot Zermatt, go for a walk through Hinterdorfstrasse, and take in the architecture and atmosphere at Intercontinental Church Society. 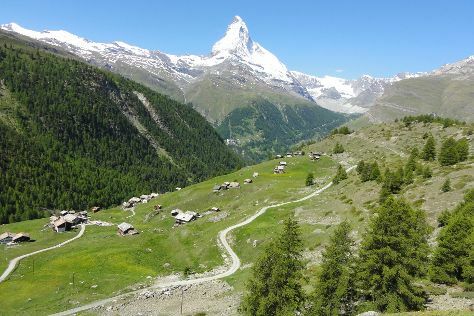 To find traveler tips, more things to do, and tourist information, use the Zermatt trip itinerary maker website . You can take a train from Lausanne to Zermatt in 3.5 hours. Finish up your sightseeing early on the 2nd (Wed) so you can catch the train to Lucerne. Kick off your visit on the 3rd (Thu): take in the awesome beauty at Mt Pilatus, then pause for some photo ops at Lion Monument, then contemplate the waterfront views at Lake Lucerne, and finally take in the views from Chapel Bridge. Keep things going the next day: fly down the slopes at Mount Titlis. To see more things to do, other places to visit, traveler tips, and more tourist information, read our Lucerne route planner . Traveling by train from Zermatt to Lucerne takes 4 hours. In January in Lucerne, expect temperatures between 4°C during the day and -2°C at night. Finish your sightseeing early on the 4th (Fri) so you can travel to Ljubljana. Explore hidden gems such as Predjama Castle and Room Escape Games. Explore the numerous day-trip ideas around Ljubljana: Sivec House Gallery (in Radovljica), Postojna Caves (in Postojna) and Bled (Vintgar Gorge (Soteska Vintgar) & Ojstrica). The adventure continues: take in the views from Tromostovje, make a trip to Preseren Square, wander the streets of Ljubljana Old Town, and partake in some friendly competition at Unlock Ljubljana. To see ratings, reviews, traveler tips, and other tourist information, use the Ljubljana day trip site . Getting from Lucerne to Ljubljana by combination of train and flight takes about 5.5 hours. Other options: drive; or do a combination of train, flight, and shuttle. In January, plan for daily highs up to 5°C, and evening lows to -3°C. Finish your sightseeing early on the 8th (Tue) so you can drive to Salzburg. You'll explore the less-touristy side of things at Salzburg Cathedral (Dom) and Untersberg. Get out of town with these interesting Salzburg side-trips: Kaprun (St.Margareta Church & Kitzsteinhorn) and Buchensteinwand Ski Area (in St. Ulrich am Pillersee). The adventure continues: explore the historical opulence of Schloss Hellbrunn, don't miss a visit to CS Galerie, stop by Alte furst-erzbischofliche Hofapotheke, and see the interesting displays at Red Bull Hangar-7. For maps, reviews, ratings, and more tourist information, go to the Salzburg road trip planner . You can drive from Ljubljana to Salzburg in 3 hours. Other options are to take a train; or do a combination of flight, bus, and train. In January in Salzburg, expect temperatures between 4°C during the day and -3°C at night. 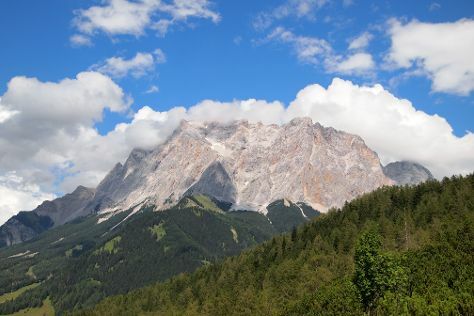 Cap off your sightseeing on the 12th (Sat) early enough to go by car to Garmisch-Partenkirchen. You'll discover tucked-away gems like Zugspitze and Schloss Hohenschwangau. Take a break from Garmisch-Partenkirchen with a short trip to Burgruine Hohenfreyberg in Eisenberg, about 52 minutes away. Next up on the itinerary: look for all kinds of wild species at Partnachklamm, don't miss a visit to Franziskanerkloster St. Anton, cruise the town with Alpenmove e. K., and pause for some serene contemplation at Pfarrkirche St. Martin. To find reviews, ratings, other places to visit, and other tourist information, refer to the Garmisch-Partenkirchen tour itinerary planning app . You can drive from Salzburg to Garmisch-Partenkirchen in 2.5 hours. Other options are to take a train; or take a bus. In January, daytime highs in Garmisch-Partenkirchen are 4°C, while nighttime lows are -4°C. Finish up your sightseeing early on the 16th (Wed) so you can go by car to Rothenburg. Start off your visit on the 17th (Thu): snap pictures at Alte Mainbruecke, step into the grandiose world of Würzburg Residence, admire the landmark architecture of Stadt Rothenburg ob der Tauber, then steep yourself in history at Spital Bastion, and finally wander the streets of Old Town. Get ready for a full day of sightseeing on the next day: admire the natural beauty at Burggarten, contemplate the long history of Burgtor und Burg, look for gifts at Ekuko's Wine & Gift Shop, then steep yourself in history at Town Walls, and finally steep yourself in history at Rodertor. To see reviews, where to stay, traveler tips, and more tourist information, read our Rothenburg online trip itinerary maker . Traveling by car from Garmisch-Partenkirchen to Rothenburg takes 3 hours. Alternatively, you can take a train; or do a combination of train and flight. January in Rothenburg sees daily highs of 3°C and lows of -1°C at night. Cap off your sightseeing on the 18th (Fri) early enough to go by car to Dresden. Discover out-of-the-way places like Zwinger and Neues Grünes Gewölbe. Explore the numerous day-trip ideas around Dresden: Windmuhle Straupitz (in Straupitz), Spreewaldfahrt, Familie Goertz (in Lubben) and Kulturinsel Einsiedel (in Zentendorf). There's still lots to do: don't miss a visit to Procession of Princes, admire the masterpieces at Gemaldegalerie Alte Meister, snap pictures at Bastei Bridge, and pause for some serene contemplation at Frauenkirche. To see where to stay, other places to visit, traveler tips, and more tourist information, read our Dresden online tour planner . Drive from Rothenburg to Dresden in 4 hours. Alternatively, you can do a combination of train and flight; or do a combination of train and flight. In January, daytime highs in Dresden are 3°C, while nighttime lows are -1°C. Cap off your sightseeing on the 22nd (Tue) early enough to go by car to Prague. 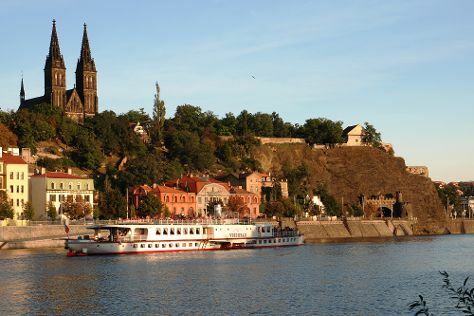 Eschew the tourist crowds and head to Food Tours and Vyšehrad National Cultural Monument. Explore the numerous day-trip ideas around Prague: Karlstejn Castle (in Karlstejn) and Památník Terezín - Malá pevnost (in Terezin). There's still lots to do: soothe aching muscles at some of the top local wellness centers, take in panoramic vistas at Petrinska rozhledna, contemplate in the serene atmosphere at Spanish Synagogue, and browse the exhibits of Lobkowicz Palace. For traveler tips, maps, where to stay, and more tourist information, refer to the Prague trip itinerary planning app . Drive from Dresden to Prague in 1.5 hours. Alternatively, you can take a bus; or take a train. In January, daily temperatures in Prague can reach 2°C, while at night they dip to -3°C. Finish your sightseeing early on the 26th (Sat) to allow enough time to drive to Cesky Krumlov. On the 27th (Sun), explore the historical opulence of Cesky Krumlov Castle, contemplate the long history of Former Fink Cafe, contemplate the long history of Latran houses, then admire the striking features of Palace Vcela, then take in the architecture and atmosphere at Church of the Sacred Heart of Jesus, and finally steep yourself in history at Black Tower. Get ready for a full day of sightseeing on the 28th (Mon): don't miss a visit to Klet', then take in the architecture and atmosphere at Christi and Our Lady of Sorrows Church, and then appreciate the extensive heritage of Historie mesta Ceský Krumlov. 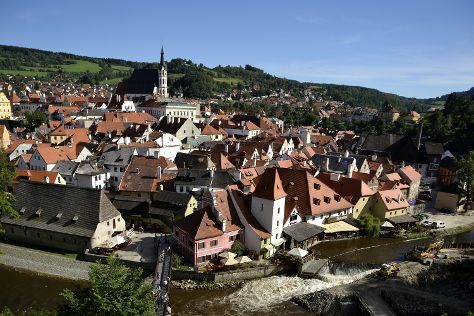 To find other places to visit, more things to do, where to stay, and other tourist information, use the Cesky Krumlov trip itinerary planning tool . Getting from Prague to Cesky Krumlov by car takes about 2.5 hours. Other options: take a bus; or take a train. January in Cesky Krumlov sees daily highs of 2°C and lows of -3°C at night. 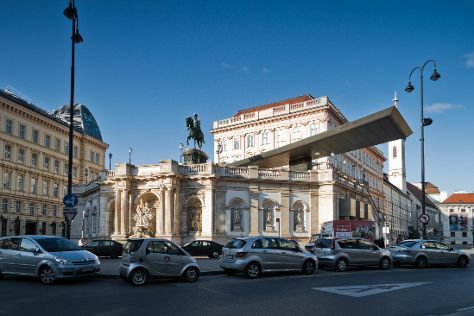 Finish your sightseeing early on the 28th (Mon) so you can drive to Vienna. Explore hidden gems such as Natural History Museum (Naturhistorisches Museum) and Melk Abbey. Explore Vienna's surroundings by going to Devin Castle (hrad) (in Bratislava), Hinterhaus Castle (in Spitz) and Domane Wachau (in Durnstein). There's still lots to do: see the interesting displays at MuseumsQuartier Wien, take in the spiritual surroundings of Karlskirche, admire the striking features of St. Peter's Church, and take an in-depth tour of Kaiserliche Schatzkammer. For photos, reviews, traveler tips, and other tourist information, read our Vienna trip maker app . You can drive from Cesky Krumlov to Vienna in 3 hours. Alternatively, you can do a combination of bus and train; or take a bus. In January in Vienna, expect temperatures between 3°C during the day and -3°C at night. On the 4th (Mon), wrap the sightseeing up by early afternoon so you can travel back home.